Check out the latest updates for small businesses and partners, and see what you can expect to drop soon. Remember, any Xero changes and release updates can be found in the Help Centre, or refer to the release timeline for any highlights. What is Cash Coding? This is now better explained for ‘non-cash-coding’ and ‘cash-coding’ permissions. Get the full story over on our blog. Now there’s no need to worry about Projects users seeing sensitive information or completing tasks outside of their job scope. Small business owners and managers are now able to set one of three levels of access to the information, and actions staff can perform within Xero Projects. Admin: Has access to everything within Xero Projects. Standard: Everything an Admin can do, but they can’t see staff cost rates. Limited: Has read-only access to everything except for cost and profitability information. 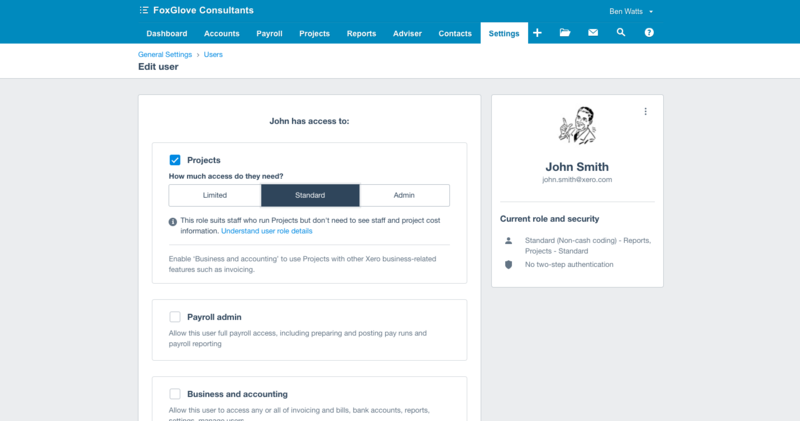 Admin and Standard users will still need to have the appropriate Xero user role to create invoices from Projects, and limited users won’t be able to create invoices from Projects, regardless of their Xero role. Learn more on our blog and Help. You’ll notice the Receipts tab has been renamed to Purchases. This is to recognise the addition of Bills to pay, Recent spending and a view of Expenses to the tab; helping you keep all of your purchasing related activity in one place. Stay on top of your bills on the go with updates to iOS and Android that allow you to manage your bills from anywhere. We’ve made the bills workflow more complete by adding the ability to view unpaid bills on mobile. See what bills you no longer need to worry about, which need paying and when they’re due; so you can easily be in control of your bills. You can now view and manage contact details without leaving an invoice or quote by tapping on a contact name. It’s easier and faster to edit contacts on the fly as you’re in the middle of invoicing or sending out a quote. With this latest mobile release, you can copy invoices (excluding drafts), so it’s easy to copy details over to a new invoice without having to replicate any entries; the date defaults to today’s date. Save yourself some time and effort. The same as the above is now available for quotes on iOS. You can copy over a quote and therefore minimise duplicate efforts. You can expect this release to drop for Android shortly. This one’s for you and your customers. 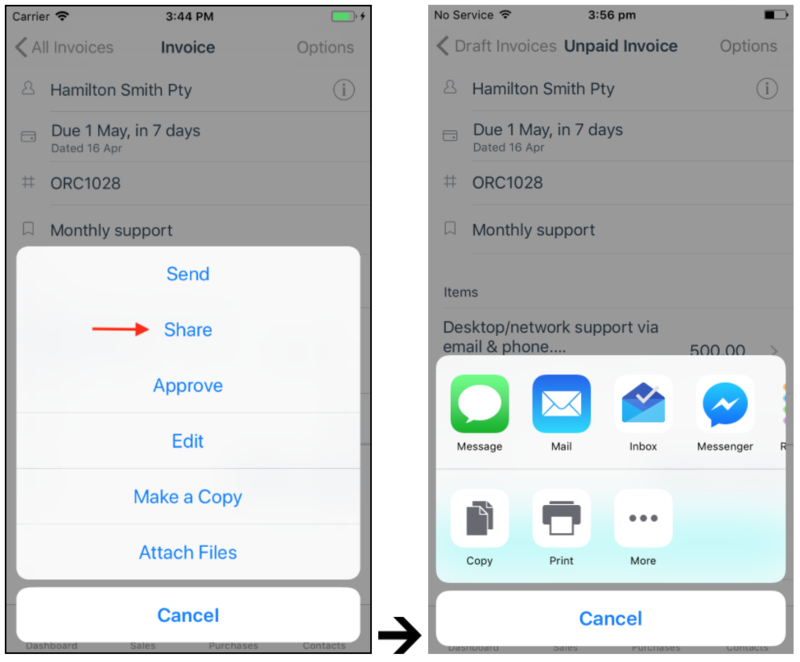 With this release, you can send invoices from iOS and Android via the app that works for both of you. Many small businesses find themselves communicating with customers through a variety of apps, some of you might prefer Facebook and other social platforms to keep in touch on things. So the ability to send invoices this way gives you more choice of communication and helps you get paid faster by meeting your customer’s communication needs too; which may be moving away from email. With this latest release, it’s even more seamless to get an invoice out the door on mobile. Your default tax setting within financial settings (on Xero’s web version) will apply on mobile as well, unless you have selected a contact with its own tax setting. Some people might argue that printers are soon to be extinct. However, if you’re amongst those working from home or simply want a paper copy of your invoice for whatever reason, printing things still have a place in your workflow. As you realise you need to print something while doing work in Xero on your mobile, you can now print wirelessly from your iOS device to your printer with AirPrint. 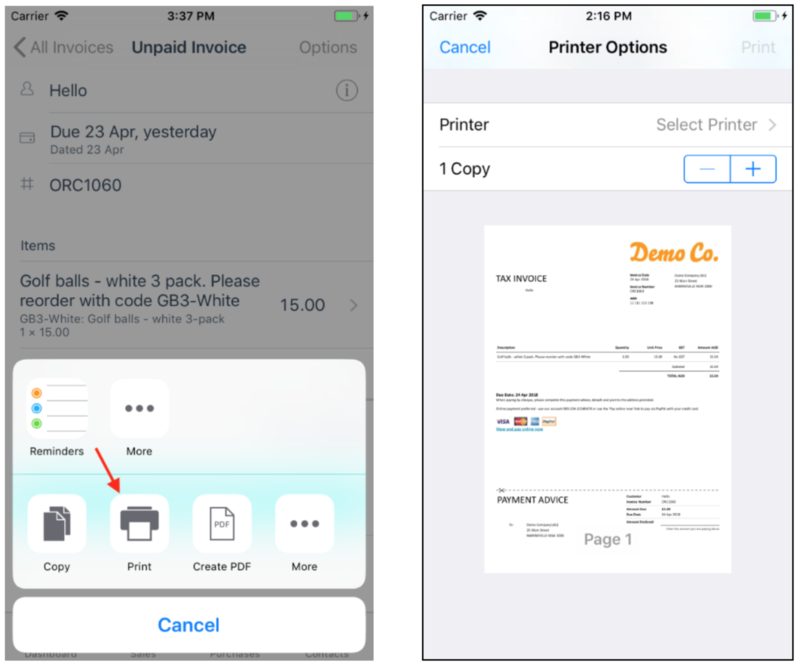 From the share sheet, print an invoice using Airprint by selecting the “Print” option. To cater for the way you do things even more closely, from the share sheet, it is now possible to preview and download a PDF copy of the invoice by selecting the “Create PDF” option. From this view, you can save the PDF into any cloud storage provider that’s been set up on your mobile. You no longer need to keep two separate logins for XPM and Xero. With this latest update, you can now use your Xero login credentials to log in to your XPM or Xero Tax accounts and make use of 2-step-authentication at the same time; keeping your data even more secure. Practice Staff will now be able to attach files to any type of question they create. Look for the paperclip icon in the “Ask a question” box to add an attachment. Adding a file helps with creating context and makes things more straight-forward for advisors and their clients. For Xero users in the U.S. we have expanded U.S. payroll support to include New Mexico. Xero Payroll administrators and accountants can now process payroll for employees in New Mexico. Xero provides in-product worksheets that employers can use to manually or electronically file New Mexico taxes outside of Xero. All new orgs (created from 21 March) will get new 15% rates (same names as old rates, with the new 15% rate) + the old rates with the name prefix “Old 14%”. 29 March – All existing orgs will get the new 15% rates + the old rates will be edited to add the name prefix “Old 14%”. 3 April – New rates will be made the defaults in any accounts, contacts, or inventory items where the old rates have been used. All name changes to tax rates will affect any transactions that use the rates, but only as a name change, the rate will stay at 14%. Coming soon on iOS and Android, you can easily add a contact while you’re doing your invoicing. You no longer need to jump into Contacts in order to add a contact; instead, add them on the fly as you’re invoicing your customers. Saving yourself precious time in a day. Soon, you can mark your bills as paid on Android and iOS. This view helps maintain a more reliable picture of your business’s expenditure and cash flow as a whole. A complete picture of your upcoming costs should make decisions relating to cash flow easier. You’ll be able to benefit from using a payment gateway even if you prefer to send a printed invoice. By adding QR codes to invoice templates, your customers will be able to scan the code with their mobile device and pay directly online. With this upcoming release, you’ll be able to easily view which Payment Services are active on online invoices you send to your customers. You’ll be able to add or change these without leaving the invoice screen. It’s a way for you to easily ensure that credit card, debit card and PayPal payment options are available to your customers; offering flexibility and helping you speed up invoice payments. Small Businesses and partners will soon be able to manage reimbursable expenses seamlessly from anywhere with the new Xero Expenses on web and mobile. Single Touch Payroll (STP) is changing the way employers report to the Australian Taxation Office (ATO). STP will be mandatory from 1 July 2018 only for employers with 20 or more employees and optional for all other employers. We’re working closely with the ATO to roll out STP in Xero Payroll over the coming months. This will make it simple to set up and process pay runs in compliance with the new requirements. You can find more details and recent updates on Single Touch Payroll on our blog. 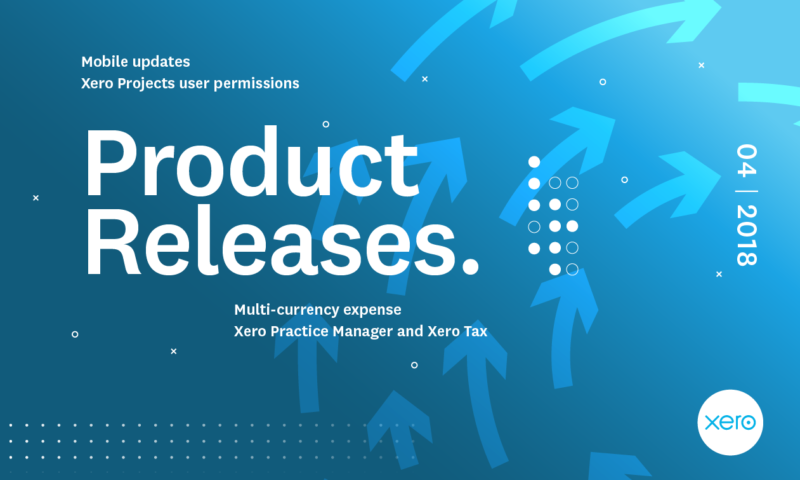 Small business owners and managers will soon be able to set the level of access to information, and actions their staff can perform with three levels of users permissions in the new Xero Expenses feature (also coming soon). Soon you’ll be able to accurately record every minute you spend on chargeable work, from anywhere with the stop-start timer on Xero Projects for iOS and Android. Coming soon, the Xero Projects Time Details report will small business owners and managers exactly how their team’s time is being spent on each project and what proportion is chargeable. The post Xero Global Release Update April 2018 appeared first on Xero Blog.